As I look at these pictures, I’m mourning the last of my freezer meals. Gathering with friends (or just taking a few hours by myself) to whip up some freezer meals makes all the difference with my week. When that crazy “”What’s for dinner” hour hits, this is my answer. I shared earlier about my most recent meal making day with my friends. Our freezer friendly Chicken Tetrazzini went quickly and honestly, my sweet girls went to town on this Chicken Cheddar Broccoli and Rice Casserole before it even made its way to the oven. Since everything was already cooked when you mix it up, my girls decided it was SO good straight from the bowl and didn’t want to wait. Yep, I had to make up a few more right away since I knew these would go fast. When you thaw it, you’ll notice a tiny bit of water. You can pour it out if you like firmer rice or else the water will be absorbed back into the casserole once it bakes in the oven for a creamier texture. Before serving, let it sit a few minutes when you take it out of the oven. 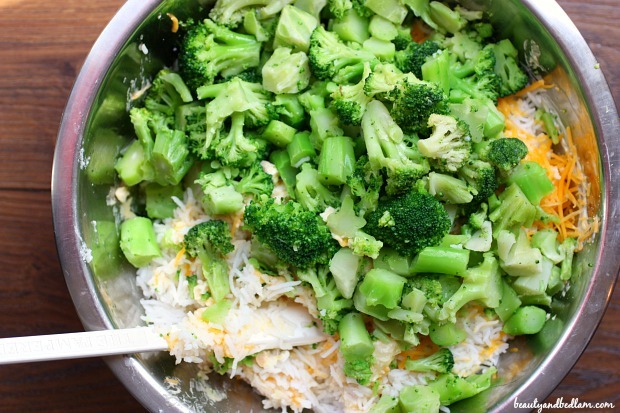 Everyone in our family loves this combination, but we are huge broccoli, rice and cheese lovers so adding in the protein for a complete meal just makes it even better. This is a very flexible recipe. You can see by all my *optional ingredients below, that you can tweak it to your family preferences without changing the recipe. I never add the mushrooms, but my husband LOVES it with mushrooms. I always add extra sauteed onions and minced garlic in everything, so there are times when I’ve used two whole onions because we love them that much. You do not have to saute them For time sake, raw, chopped it fine too. Also, play around with how much mayo you use. I’ve used two cans of soup and no mayo or less mayo. There are times I’ve wanted this to be heartier, so I’ve added in much more chicken than three cups, but also times that I’ve wanted to stretch my proteins so I added more rice and less chicken. Is there a theme here? Make this your own. Since everything is cooked, give it a taste test before you add it to the freezer bag. That’s what I do everytime to make sure I have it tasting just how we enjoy it. In my opinion, I would quadruple the amounts and freeze this for multiple meals. It was such a blessing to send my niece home with a few meals since she stopped by with her two week old new blessing on the day I was preparing. It’s always worth it to make additional for the freezer. 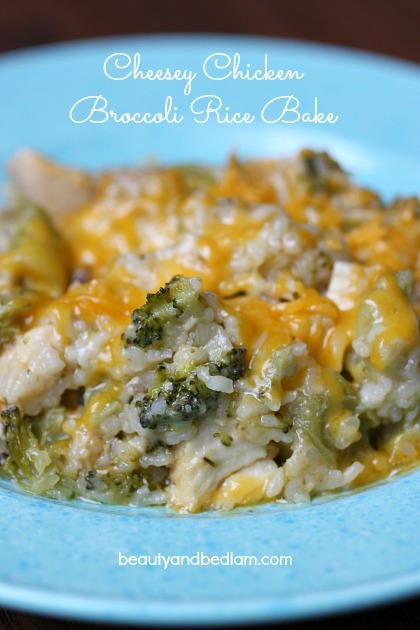 Summary: This deliciously freezer friendly Chicken Broccoli Rice Casserole is such a perfect comfort food casserole. Cook rice and broccoli according to package directions. Mix broccoli, chicken, rice, soup, mayo, curry, seasoning, onions*, garlic*, mushrooms* and one cup cheese together in large bowl. Taste test and season to taste. Place in large freezer bag or spread into 9×13 pan to freeze. 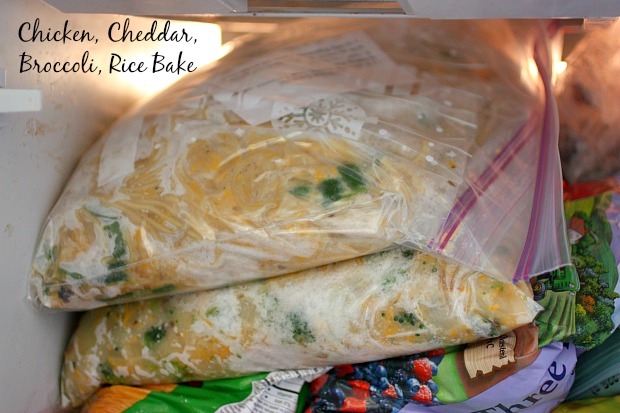 Store last cup of shredded cheese in separate freezer bag to be used at baking time. To serve: thaw dish and give a thorough stirring before placing in oven. Bake covered at 350 degrees for 30 minutes. Remove foil and sprinkle remaining cheese (or more if desired). Oven times may vary. Everything is cooked, so goal is to serve hot and cheese melted on top. Really? I wish we would have run into each other, but wow, it was SO HUGE! !